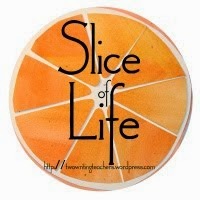 I'm slicing with the Two Writing Teachers community for Day Ten of Thirty-One of the Slice of Life Challenge in March. Thank you Stacey, Tara, Anna, Betsy, Dana, Kathleen, Beth, and Deb. Ramona at Pleasures from the Page wrote a lovely post yesterday celebrating Simple Pleasures, and asked what others' simple pleasures might be. I loved the way she wrote, and knew one thing I was likely to choose, about one of my granddaughters. 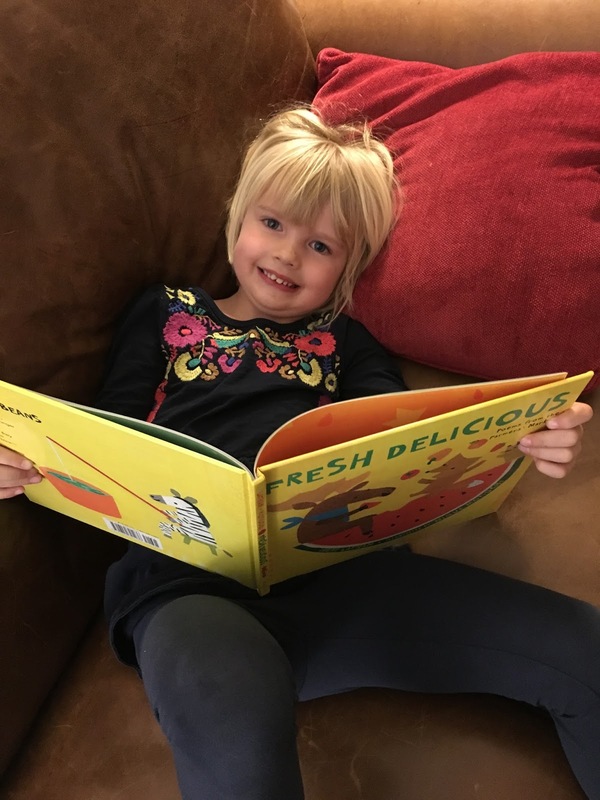 If it's Wednesday, after school, that means Imogene, my four year old grand-girl comes to stay, to travel to a park or to play or to read, OR all three. I have various toys still at my house, a box of blocks and one of legos, a bucket of matchbox cars, and a tiny box of cheap plastic wild animals. Imi comes in after school, has a quick snack and starts playing-something. I have grown to understand that this isn't the time to talk much; it's like a decompression from school, rather like the commute home that many say they need. I usually ask if she's had a good day; she usually says "yes". And I ask what was a good part of the day. Today it was that Penelope, her friend at school who had a bad eye accident, got to take off her eye patch. Yes, it's a great school, and yes, Imi does lots of interesting activities, but she also loves her friends, and this eye accident has been much on her mind. I have spent money buying toys for the grandkids. I like toys and there are new ones created every year that look like they would be such fun for "pretend". These tiny plastic animals have been in a small box for years. I imagine they get restless at night and come out to play in between child visits. I suspect I may have picked them up at a garage sale. Today, Imi played with them for about two hours. 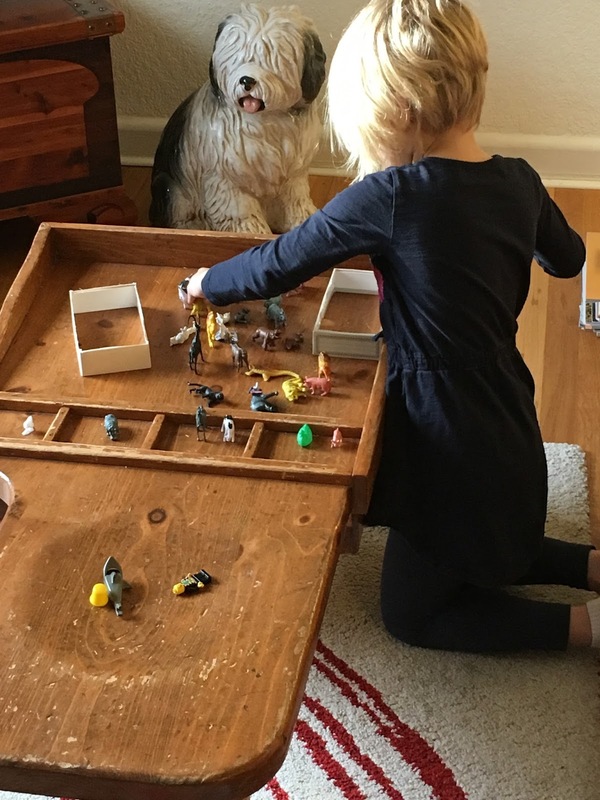 Here is one picture of the play at my old scarred-by-children table. She needed some ideas for making a "cage" or "enclosure" for the animals, so I cut the bottom and top out of an old check box. That's it. There was grouping, a display of those identified as the "babies", a show (she created a line saying it was a parade. She hummed sometimes, and talked as if she was one of the animals sometime. It's a peaceful time sitting and watching a child play, "hearing" the thoughts (almost like eavesdropping). And then there's the reading. We read Irene Latham's Fresh Delicious: Poems From The Farmer's Market and David Wiesner's Mr. Wuffles tonight. Imi loved both, spent her own time looking and looking at Mr. Wuffles after we read it. It is a wordless picture book, but includes some interaction between Mr. Wuffles (a cat) and some space aliens-yes, really! Imi is in love with Star Wars! When you read to Imi, she listens and interacts with the tension, and knows that not all stories are easy to resolve, but soon will be. She observes with attention. Later, I found her on a corner of the sofa, re-reading both, and before we left for home, she asked to read more poems from Irene. It looks like fun! I love watching little ones when they get in their own world of play! Imi looks so comfy and cozy reading . . .I would say she has decompressed! Yes, she did. It is fun, and always interesting to see what she chooses to do. Thanks, Lynn. Thanks, Irene, I thought you might love it! And it is wonderful to watch all the different ways children play. Oh, I love this simple pleasure. I feel like I know Imi from hearing of her adventures with you. Is that a real dog in the first picture? I love listening to children.. . my friend Imi has recently taken to naming body parts during church, so we get to practice our whisper voices. We had a sheepdog long ago, and no, it isn't real, but a glazed piece we found at a gallery once, purchased to remember. Love your "whisper" voices, Ramona. And thanks again for the idea. Simple pleasures, indeed! What joy to spend an afternoon every week with this curious mind. So jealous! It is a joy, Elsie. I am lucky. When your granddaughter gets older, it'll be time for her to visit as I used to do with my one set of grandparents. I loved it, as she will! I hope that when I will have grandkids I will have the time for them. More and more grandparents are busy working and can't find regular time to be often and fully present with their grandkids. I like how you provide a place and tools and then let her just play. All through the years, even when teaching, I made time Terje. I bet you will, too. I love that you recognize that kids need decompression time as much as adults. Love that picture of Imi! Thanks, Jennifer, and yes, I do know it, but everyone in different ways. You show so much respect for Imi as a person, Linda. And the toys and books that you have are awesome for building imagination and creativity. Love toys without batteries or plugs. Those batteries and plugs aren't needed are they, Melanie? I've actually seen little kids use their fingers as people if nothing else is available. Thank you. She will remember these moments with you forever and ever. I hope she will, Loralee. I remember really great times with my own grandparents. Thanks. I'll say this again - you are both so lucky. And how wise of you to let Imi have her quiet time after school. We all do, don't we? I need at least a couple of hour's worth of quiet after my school day, time. It really is part of what we all need, some transition between the flurries of the day, to get to the evening calm, at least most of the time. Thanks, Tara. What a lovely way to spend the afternoon. I love how engrossed Imi is with her little animals. How lucky you both are! Thanks, Catherine, It is a very nice time. What precious simple pleasures. These are times that Imi will remember forever. I recently spent some time with my grandmother who has dementia. Although I know she doesn't completely remember me, I like to think that she enjoyed out time together - just like you two. That's so nice, Leigh Anne. I used to spend time with my grandmother in that way, too, a little bittersweet, but still loved holding her hand and being with her. She'll be wonderful, Jennifer! And spending time with her grandparents, too! You've described it perfectly, Ana. And when it is the no-other-activities day, you both can relax into the evening. It is a nice time. Your grandchild is a delightful source of wonderful stories. I just love seeing her involved in imaginative play and reading. What a wonderful smile! Thanks, Carol, she does love to play and read!